Today’s posting is a Flashback Friday posting. I lived in Astoria, NY for a year and liked it a lot more than I thought I would. After living in Manhattan for 5 years, it was refreshing to open my front door and look across the street to see Astoria Park and the Tri-boro Bridge. I guess this is the feeling the folks on Central Park West must feel like in the morning! 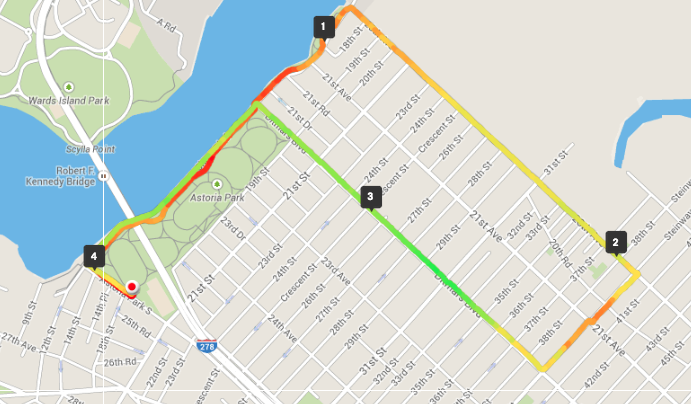 I had a number of routes mapped for Astoria and this is a 4 mile loop that anyone in Astoria should enjoy. Start at any point on this route and finish the loop since it spans northern Astoria. (Run 4/10/14) I would typically start this route at the track in Astoria Park, then head north on Shore Drive along the East River to the power plant on 20th Ave and hang a right. Head all the way down to Steinway St. and make a right down to Ditmars Blvd. and make another right. Head back to Astoria Park and make a left on Shore Drive and head back to the start at the Astoria Park track. Only two significant rises that take place over a 1/2 mile span. 3 hills for a ratio of 0.75. 0.5. You will usually run into one or two smokers on Ditmars. Astoria has one of the lowest crime rates in the 5 boroughs. I regularly ran this route at night after work from 9pm to 12am and felt safe as an average-sized male. I would probably exercise more caution since there are isolated stretches along 20th Ave. The only crowded portion I ran into was on Ditmars but I like that stretch because it has great vibe at most times of the day. If you want to avoid the crowds, head down Steinway to Hoyt Ave S and head back to the park that way. The park has bathrooms that are open generally until 7pm. Great views of the Triboro Bridge, Astoria Park, and Ditmars Ave (one of the main drags in Astoria). Great for group runs since the promenade along the East River and the north side of 20th Ave provide ample space to run. Running down Ditmars is hit or miss during the day but manageable. Three quarters of this route is fairly free of the worry of vehicular traffic. You’ll need to look alive on Ditmars as you’ll cross several streets on this stretch. Moderate! Approximately 5 major intersections where you probably need to stop if you don’t catch the light.